They’re a versatile bunch of dome cakes. I’ve generally reduced the sugar after disappointing experiences with very sweet shop-bought mousse cakes (Japanese ones excepted). Mousse. White chocolate is pretty sweet so I replaced half with tangier fruity ruby chocolate – an exciting newly-invented natural ‘fourth chocolate’ (see the inventor Barry Callebaut’s ruby chocolate article here). And I used Cocoa Barry’s lovely not so sweet Zephyr white chocolate. The cream cheese or greek yoghurt is replaced with healthy low-calorie tangy skyr (from Lidl) to help in the good fight against too much sweetness. Fruit insert and glaze. The low-sugar sour cherry inserts add more fruitiness and optional kirsch cherry liqueur gives the glaze an extra kick. Of course you can substitute the cherry with other fruit like strawberries or raspberries. Biscuit bases. 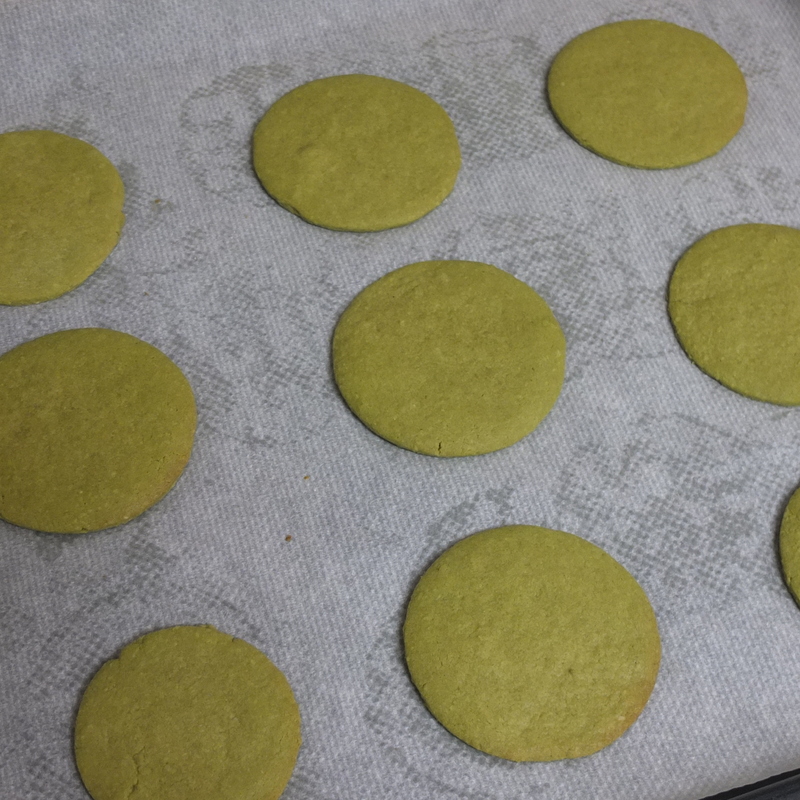 You can make the original pistachio bases but I opted for lower sugar gluten-free pleasant slightly bitter soft green tea ones (and leaves). 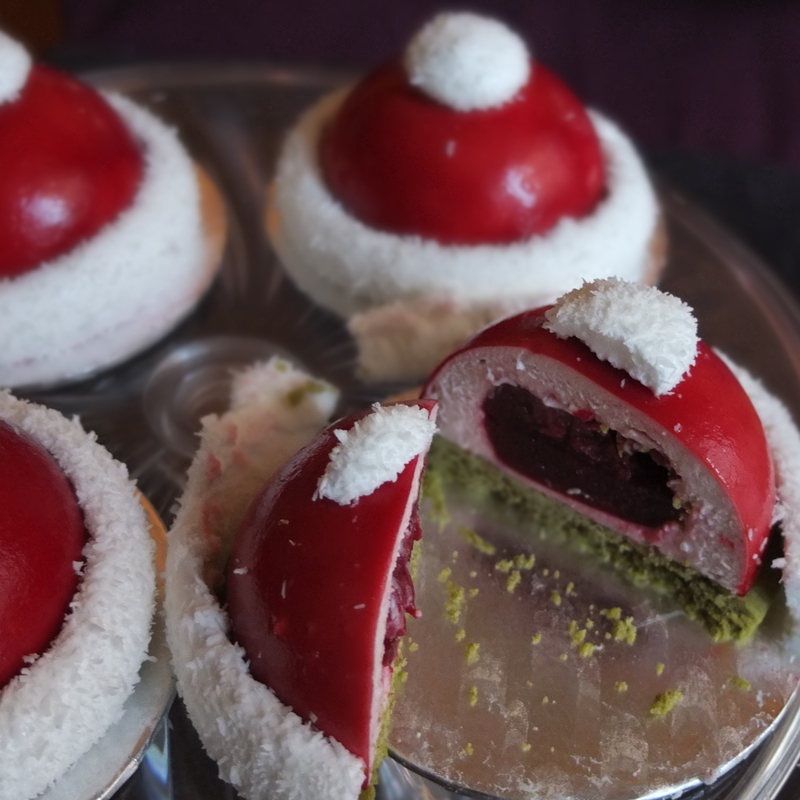 The green base on Santa’s hat is a bit ‘original’ – for a more neutral colour and flavour replace the matcha with flour. Marshmallow. This is surprisingly light and not too sweet! A quick substitute could be piped whipped cream. As usual you can play with the elements. These are adapted from Pepe Rodriguez’s original recipe – here in Spanish: ‘Cremoso de yogur griego y chocolate blanco con glaseado de cereza’. 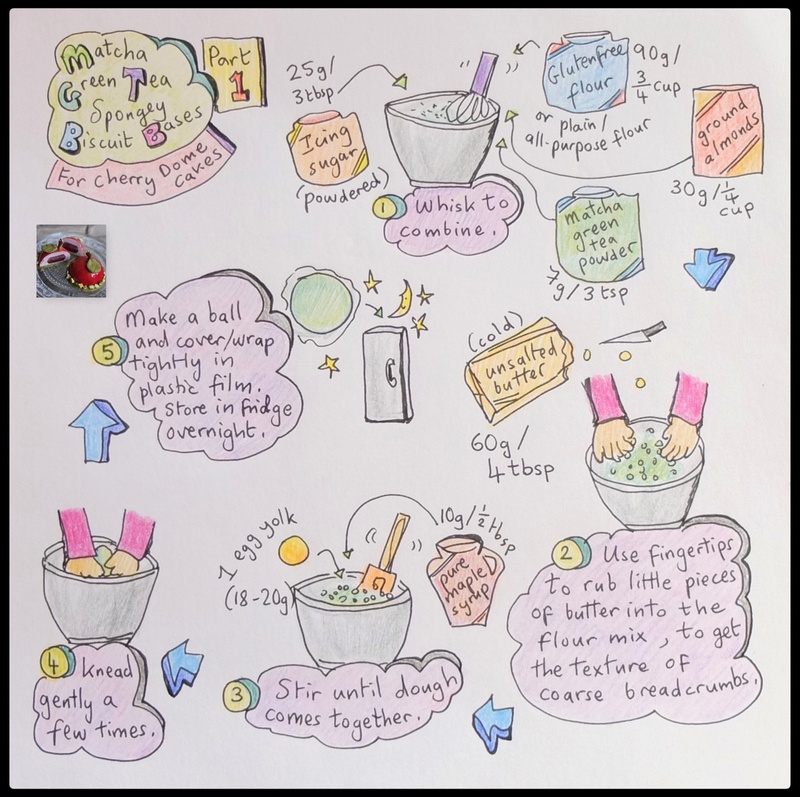 DAY 1 – cherry inserts (5-10 mins work), freeze overnight. 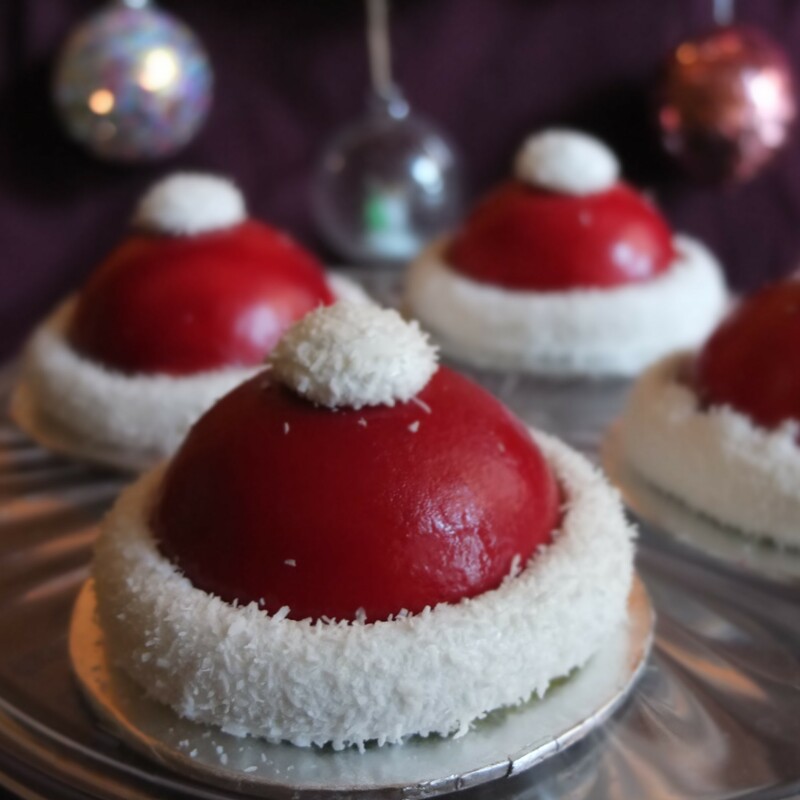 DAY 2 – mousse domes (20 mins work), freeze overnight and matcha pastry ball (10 mins work), refrigerate overnight. 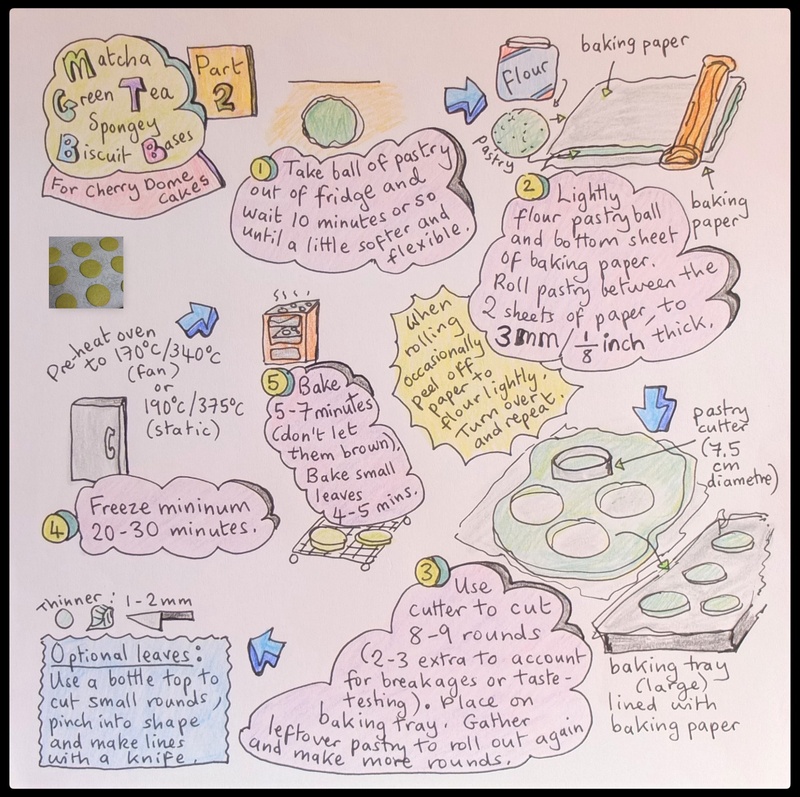 DAY 3 – bake matcha bases (10-15 mins work, 6 mins baking), make marshmallow (20 mins waiting for gelatine to hydrate, 10-15 mins work, 1 hour drying), make glaze (10 mins work, 30 mins or longer thickening) and assemble (20-30 mins work). Note: can be made over 2 days if inserts are frozen 4 hours in the morning (of Day 2). Or make all the elements spread over 1 or 2 weeks in advance. 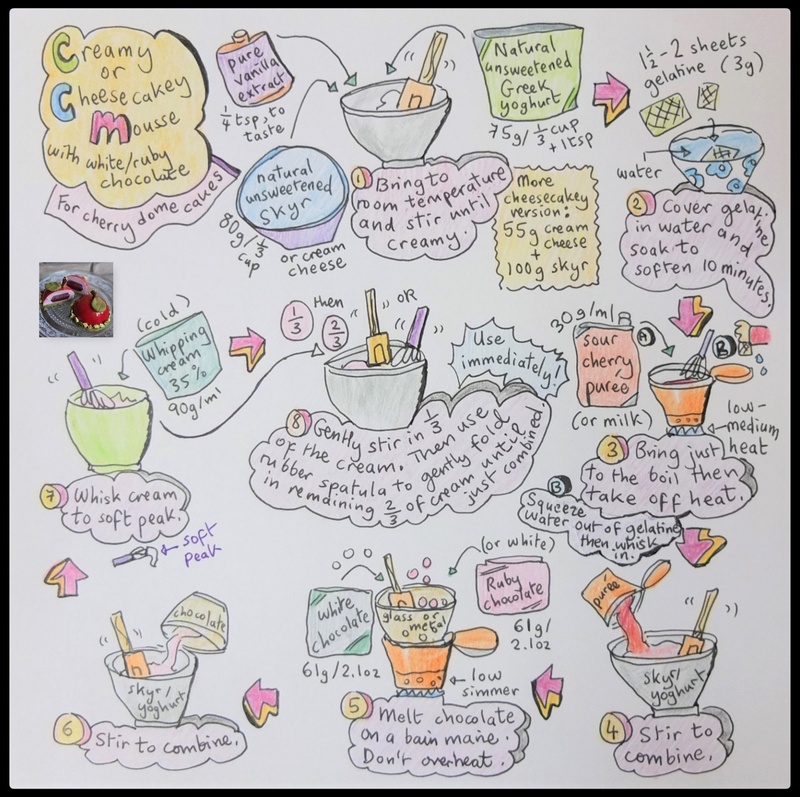 Cover gelatine in water to soak and soften 10 minutes. Gently bring purée and maple syrup to boil in a small heavy-based saucepan. Squeeze water out of gelatine leaves then add to purée and whisk well to combine. Allow to cool 5 minutes then pour the liquid to fill 6 of the cavities in the insert mould. 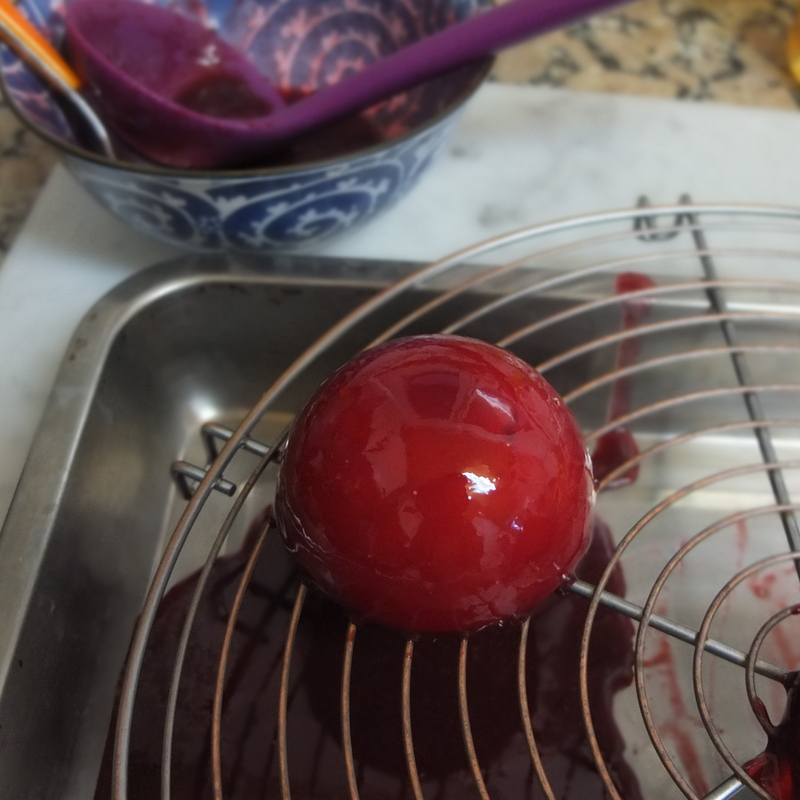 Cut sour cherries into quarters and place a few pieces in the other 6 cavities in the mould – fill to the top with the liquid. Freeze overnight or 4 hours minimum. When the mousse is made immediately fill 3/4 of the semi-sphere moulds. Save a little mousse. Join two frozen inserts (one half plain jelly and the other with cherries facing downwards). Trim with a sharp knife if necessary to join. Push the insert down a little into the mousse (not to the bottom) and scrape across with offset metal spatula knife or butter knife. Cover over gaps with the blobs of saved mousse then gently scrape a small or large metal spatula knife across the top to smooth evenly. The leaves are made with thinner pastry. Allow to cool before assembling. I like to wait 30 minutes to an hour, when the marshmallow is set but moist so it sticks to the domes. To avoid waste, the quantities given cover 6 domes if you scrape glaze that dripped below back into the bowl. For a simple faster process double the quantities and save leftover glaze in the fridge for next time. You can pass the glaze through a sieve if needed. 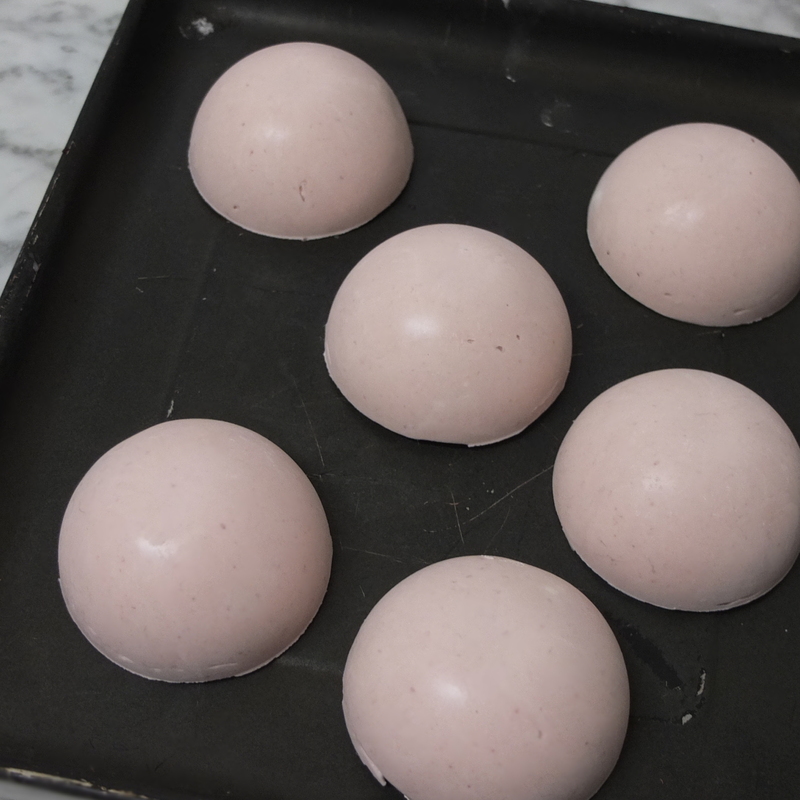 An hour or more before assembling unmould the mousse domes and return to freezer on a tray. Set up a wire rack on a baking tray with an offset metal spatula and ladle handy. Set out matcha biscuits on a plate or mini cake bases. When the glaze is the right consistency (thicker but not lumpy) and has no bubbles (remove with rubber spatula/spoon) place one test dome on the wire rack. If lumpy warm up the glaze a little. If too thin and runny wait for it to thicken more. With practice you’ll know when it’s ready. Ladle the glaze over the centre of the dome in one go and swirl a little to catch uncovered sides. If it looks too thin it’s possible to ladle glaze over just a second time but it’s a bit risky. Use a little offset spatula to carefully place the glazed dome on a biscuit base. Repeat the process with the other domes, one at a time. If necessary scrape the glaze in the tray below back into the bowl. 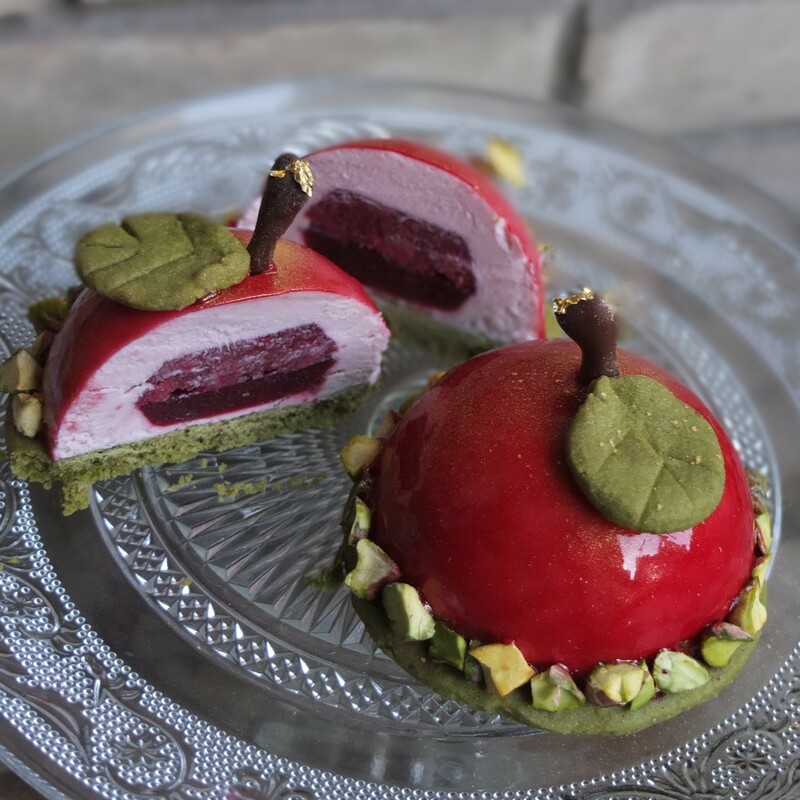 If making cherries stick little pieces of pistachios along the sides and a chocolate stalk then matcha leaf on top. To make santa hats surround the lower part of the dome with a marshmallow strip. Cut with scissors (leaving enough to account for shrinking after a stretch) and join the marshmallow. Stick the bobble on top. Stray dessicated coconut looks like snow. Can’t decide which I prefer! Defrost 3 – 4 hours in the fridge before eating. They keep really well stored in the fridge up to 3 – 4 days in airtight tupperware. They also freeze well but the glaze might not look as good. Your stomach won’t mind… Yum. I’m sharing this with the Cooking the chef group and you can see lots of info about Pepe Rodriguez on their page here (sorry, ran out of time for writing more about him) plus there’s all the group’s recipes. 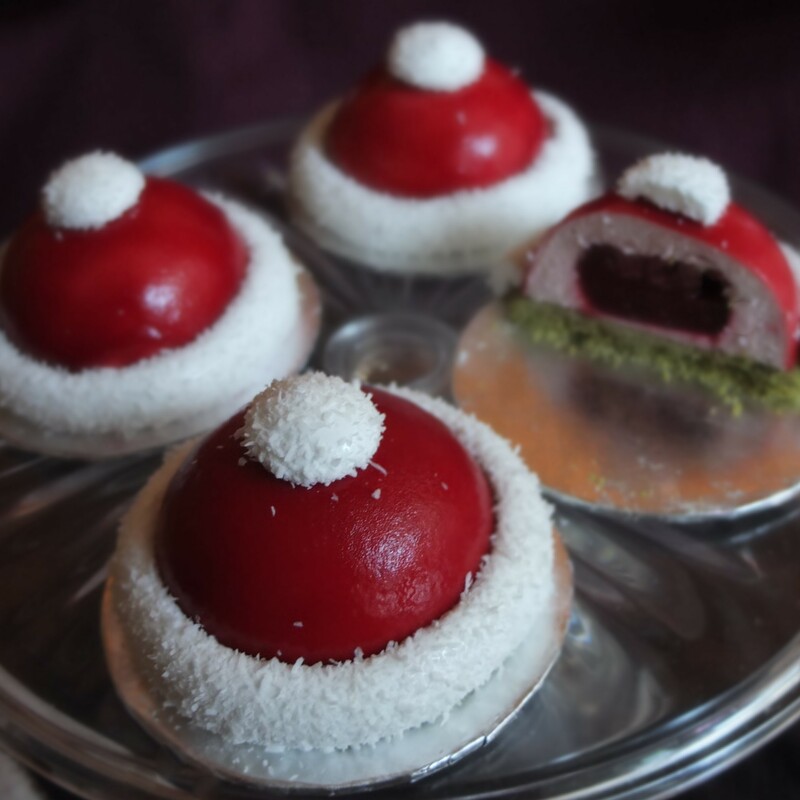 Do try these santa hat cherry and matcha dome cakes! I gave one to a friend in a mini cake box and he ate it all on the way home (couldn’t wait). Gave it multiple yummy thumbs up. 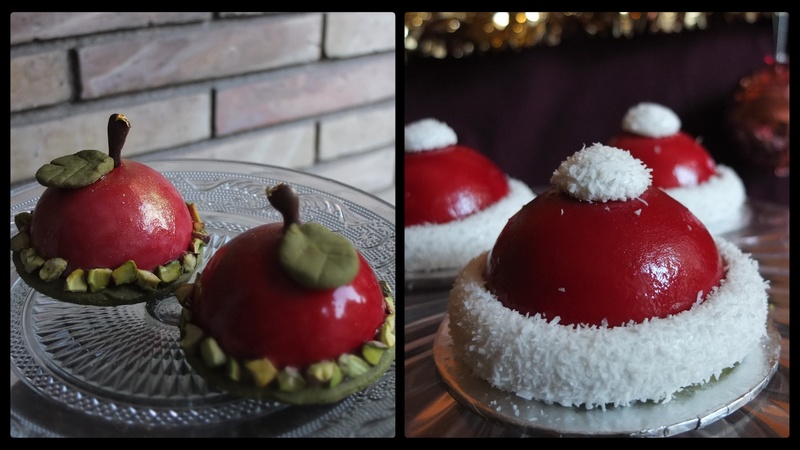 Mum’s cakes are waiting for her in the freezer but she loved the photos and texted ‘They are funny and look delicious! Clap clap (emoji)’. 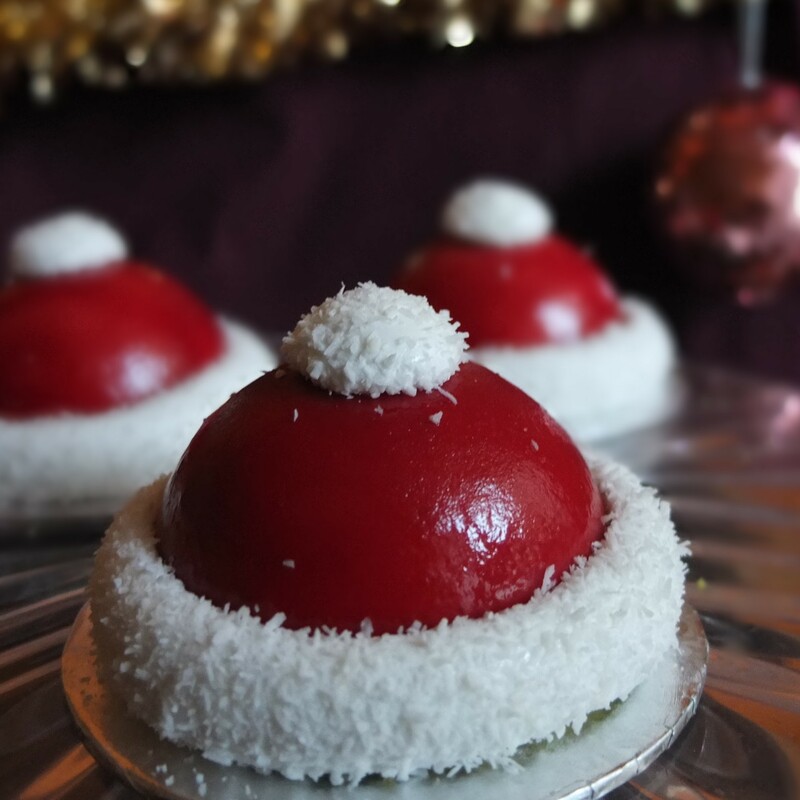 You’d surely get smiles, enthusiastic applause and happy tummies with these delicious cakes! …or as festive Santa hats. que preciosidad de postre has elaborado!! ideal para navidades y seguro que delicioso… a ver si me atrevo a hacerlo!! Lili these are amazing! They look absolutely perfect and I’m sure kids would adore these! The Santa Hats are so adorable! They all look wonderful. These are sure to be another big hit with your friends and family! The Santa Hats, and Cherries are amazing. I always imagine how much standing and rolling you must be doing and think of how my back would be reacting to all the baking requiring long time standing that you do. You must have very great shoes, and cushioned flooring to do all the amazing, world class baking you do! Thank you Deborah, that’s so sweet! 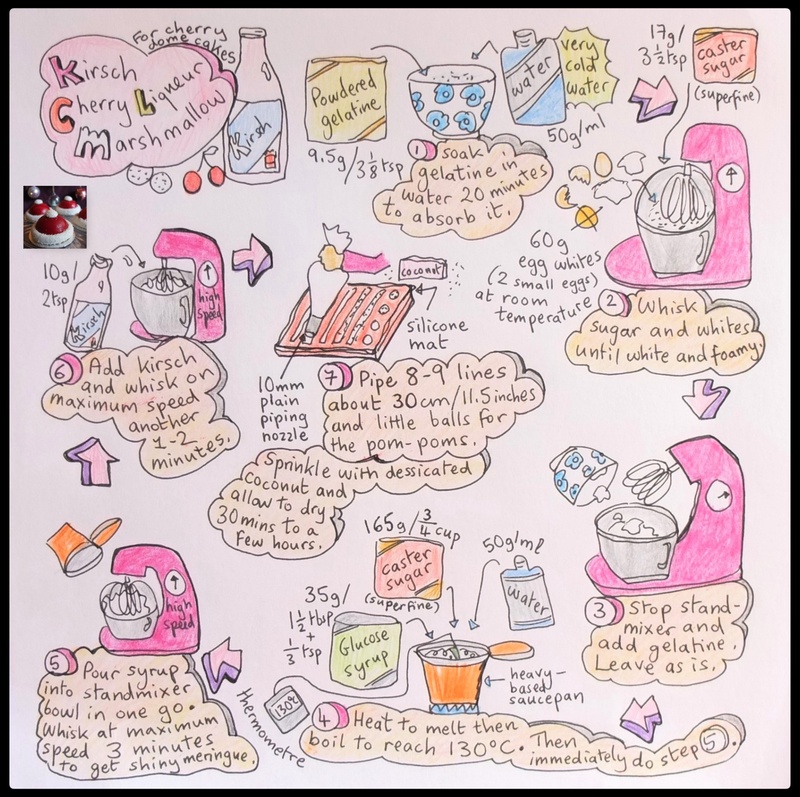 And so encouraging – will keep working in the kitchen! It’s true that it is quite good exercise for me and gets me off the sofa. Hee hee. Barefoot on tiling. Surprisingly these cakes are not that arduous and don’t take that long to make. But it’s all relative! Qué quieres que te diga, me he enamorado de la presentación y de la elaboración que has hecho. Sin palabras me has dejado. Me has dejado con la boca abierta con esta presentación tan bonita del postre. Además de que me parece delicioso, el toque navideño que le has dado le va de maravilla y es un plus. 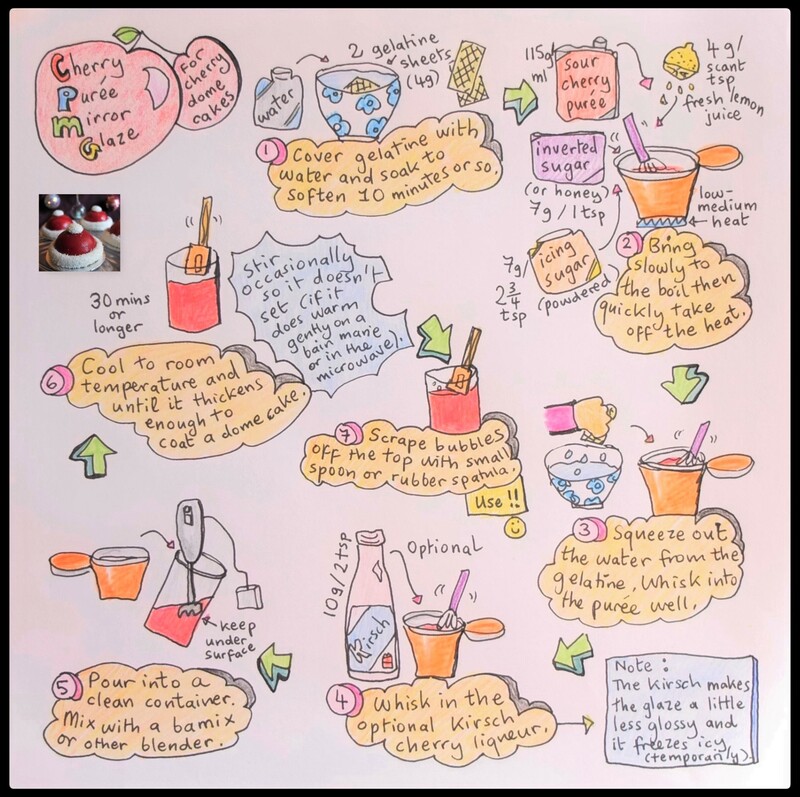 No has podido elegir mejor receta para el reto. Me parece preciosa la presentación, muy acorde para estas fechas. Felicidades, te han quedado unos dulces de lujo y muy profesionales. Un gran trabajo con resultados espectaculares. Desde luego, reto más que superado! La currada que te has llevado… Aunque por supuesto la recompensa la tienes sobre la mesa, te han quedado fantásticos! Enhorabuena!!! Thank you Josette! Wishing you a lovely run-up to Xmas! Un postre de diseño absoluto, que bonito!! Te ha quedado espectacular. Ideales para estas fiestas.